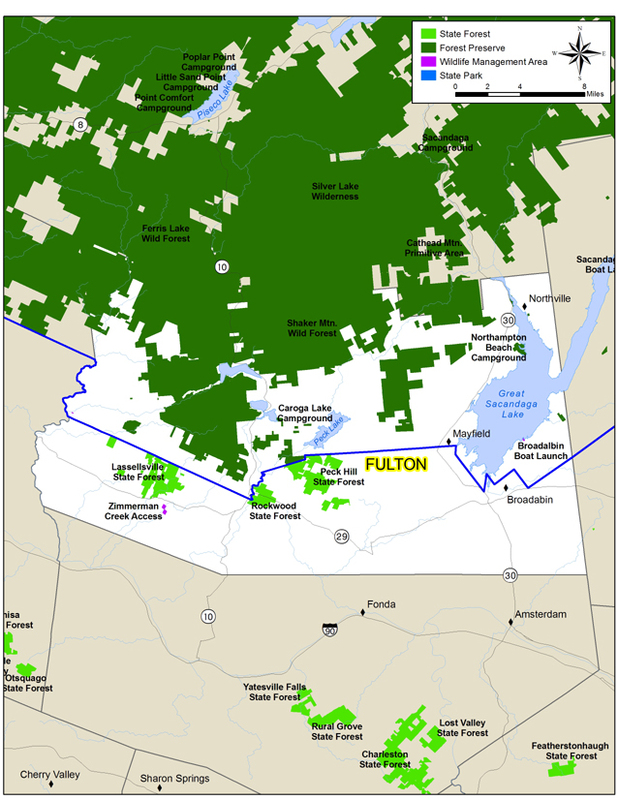 Fulton County is located west of Albany, in the southern foothills of the Adirondacks. In fact nearly half of the county is located in Adirondack Park. This gives the county numerous great hiking destinations to explore. The county seat is Johnstown, which is nearly a two hour drive from the Syracuse area. The population of the county, according to the 2010 US Census, was 55,531. The highest point in the county is Pigeon Mountain at 2780 feet located in the northern part of the county in Shaker Mountain Wild Forest of Adirondack Park near the border with Silver Lake Wilderness. This is also near the county line border with Hamilton County. This mountain can be reached via bushwhacking from the Pinnacle Road Trail and a minor trail that leads to the extremely remote County Line Lake. As far as we know there are no views from the mountain. There are two DEC State Campgrounds located in Fulton County. Northampton Beach Campground is located near Northville on Great Sacandaga Lake. Caroga Lake Campground is is located off NY 29A a few miles north of the Adirondack Blue Line (park boundary). There are also numerous privately owned campgrounds located in the county. The most popular hiking destination in the county is the fire tower on Kane Mountain, which is located near Caroga Lake Campground. There is a lean to located near Chase Lake, which can be found at the end of the drivable part of Pinnacle Road and then hiking a 2.5 mile trail. One of the most popular short backpacking-primitive camping destination is Nine Corner Lake (panorama above) located off NY 29A. Look below for links to help plan your hiking adventure in Fulton County.